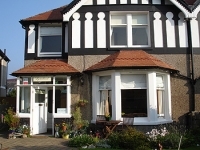 Lymehurst is a lovely 1920s house that still retains many original features. However the guest bedrooms have recently been re furbished and have a modern fresh feel. 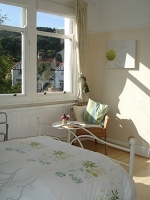 We have two en suite rooms that can be used as double, twin or triple. Lymehurst is situated in a quiet cul-de-sac but is only a 5 minute walk from the town centre with it's wealth of shops, cafes and restaurants. Many of the local attractions are only a short stoll away too, so no need to use your car. At Lymehurst we have both off road and gated parking for each guest so you'll have no parking worries. Freshly cooked brakfasts are served in the sunny Breakfast Room that looks out on to the enclosed back garden. We use local produce whenever possible. We have gardens to the front and rear with seating areas for guests.